The Nippon Pulse SCR nano-positioning stages from Micromech are available with an upgraded encoder, the Renishaw Tonic Encoder. All stages will be supplied standard with the upgraded Tonic Encoder which includes limit switches as a part of the new read head and makes ‘end limits’ standard at no additional cost. The previous standard encoder was the Renishaw RGH24, which used optional and separate read switch end-of-travel limits. The improvements of the new encoders optimise performance and eliminate the need for extra wiring with the optional limit switches. Other benefits of using this new encoder on the SCR stages include improving interpolation feedback by four times, achieving 5nm resolution without the use of a large RGB interpolator, and increased resolution and speed options. The hardware changes improves interpolation feedback by over four times, provides many more resolution and speed options and can achieve 5nm resolution without the use of a large RGB interpolator. The Tonic employs an interpolator into the connector as well as limit switches as a part of the head and magnets are added internally to the stage, to sense the limit. Compared to the RGH24 the wiring interface is different and there are changes in limit switch wiring. The PD-146-60-SE PANdrive™ from Trinamic is a full mechatronic solution, which includes a 60mm flange high torque motor, a motion controller/driver and an integrated high-resolution sensOstep™ encoder. The PANdrive™ is equipped with a high performance motion controller for high dynamic, high resolution and S-shaped acceleration ramps. The chopSync™ feature allows high-speed movement without mid-range resonance problems, and the internal sensOstep™ encoder can be used to detect step loss or to control the target position. In addition there is an input for an optional external incremental encoder. The power supply, interface and the multi purpose I/Os can be connected with small D-SUB connectors and comes with the PC based software development environment TMCL-IDE for the Trinamic Motion Control Language (TMCL™). Using predefined high level commands like ‘move to position’ or ‘constant rotation’ a rapid and fast development of motion control applications is guaranteed. Communication traffic is kept very low since all time critical operations e.g. ramp calculation are performed on board. It can be host controlled by serial interface. The TMCL™ program can be stored in the on board EEPROM for stand-alone operation and the firmware of the module can be updated via the serial interface. With the ‘CANopen’ firmware option it is possible to operate the module in CANopen networks together with other equipment. The interfaces employed are CAN, RS-232 and RS-485 host interface. There are 2 stop switch inputs, 1 homing/reference input (5V & 24V compatible) and 2 general-purpose inputs (24V compatible) as well as incremental encoder (ABN). Micromech is proud to introduce the Junma series from Yaskawa for a wide range of applications. This follows the Yaskawa policy to make user-friendly products resulting in the Junma series which is different from conventional models, because no more parameter settings and no more servo adjustments are required; therefore, the set-up and test runs are greatly reduced. In addition the Junma series has the standard servo characteristics such as high response, high speed, high torque, and high accuracy. This ultra compact servo series prospers from leading servo technology and opens new dimensions for easy configuration of drives. Junma is maybe the first programme and parameter less servo drive in the market. It uses an integrated Mechatrolink-II servo bus, which easily connects every servo drive with the other (up to 16 axis) which enables start-up and control using one cable. The Junma occupies an amazing 30% less space (requires only 15 x 2,5cm) than comparable machines in the market and with the added benefit of reducing start-up and installation time. Engineers need only select the reference pulse switch for their controller as no parameter settings and gain adjustments are needed. The drive offers short response time together with highest torque, speed and precision; notably there is starting torque of 300% for 3 seconds. The parameter less technology enables immediate start-up and the integrated Mechatrolink servo bus reduces cabling effort and enables peripheral diagnosis and configuration. There is also a version with pulse control available. The SJDE range includes AC 200V – 230V, +10%/-15% and goes from 0,1kW to 0,75kW. 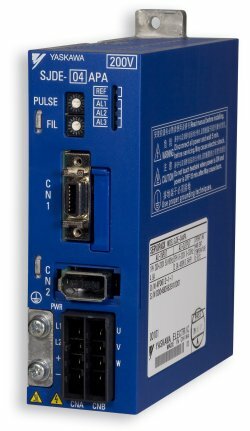 These servo drives are used extensively in packaging and assembly machines, material handling, machine tool and robotics, these new option modules allow even more machine builders to benefit from the un-paralled performance and reliability that is standard for all Yaskawa products.